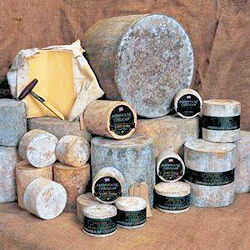 Award winning farmhouse cheddar, in a compact 454g Mini Truckle from the Ashley Chase Estate, Dorchester. Cave aged in the Wookey Caves near Wells, here in Somerset for added flavour, this waxed coated mini truckle makes a great centre piece for any cheeseboard! More about the Cave Aged Traditional Cheddar 454g ... Ford Farm Truckles are carefully Cave aged under controlled conditions for between nine and twelve months, and this Mature Cheddar has a wonderful flinty texture and a distinctly savoury flavour with a refreshing sharpness.